That tabby smack dab in the middle is the culprit! I know that many times some of the cats will come into my room and sit in the window sill for a while, usually because they long to go out and I haven’t heeded their demands to go let them out. If they get irritated enough at my lack of obedience, they knock my box fan out of the window, and then I *have* to get up to put it back, so I may as well go let them out. They really are cunning creatures. So, last night I thought maybe I just hadn’t seen her come in and sit in my window sill. But this morning, as I was carousing around online, the same cat came in my room, scuttled past me to jump up on my window sill, and disappeared! Before I could even think of what happened, Callie, the big fatty we have, jumped up on the window sill, right next to the fan, and she disappeared also! So I’m sitting here looking at the place where in the space of a few seconds two cats disappeared, thinking How’d they do that?? And suddenly another cat pops up on my window sill, on my side of the window, and jumps down and scurries off to the kitchen! I finally got up to examine the window and discovered that one of them ripped the screen out of the frame in one corner…presumably that little she-devil, Princess Tigger Tabby Whatever Her Name Is. She’s the only one who does that pick-pick-pick at the screen when she wants to come in. And now she doesn’t have to. Grrrr. From the traffic in and out of here just this morning, I can see that news of this new portal in and out of the house has traveled through our “small” feline herd faster than the Amish grapevine. 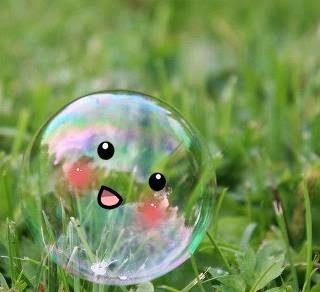 A wee tiny bubble of happiness. A friend blogger, Heidi, likes to write something about what she has gotten done each week, and she calls it Three Things Thursday, which I will also call this. Our family has been so busy lately and most weeks things are hectic with various appointments, the kids’ activities, etc. I’ve neglected ECDS and feel really bad about that, but you know, I’ve learned to accept that sometimes I’m just not going to be able to do everything I’d like to. It is what it is. 1. I found a link to a website that has recipes to make and freeze 14 meals at once to use in the crock pot at a later date. I knew instantly that this is something I want to try. I have a few friends who are way more organized than I am, and one in particular, Meg, has done this kind of thing and has always had tips on meal planning and similar stuff. You’d think that with my love of cooking and my The Magic Meal Fairy blog, I’d always be happy to be planning meals or cooking, but truthfully, there are times when I’m just tired or dealing with other things and it feels like planning out our meals and then making them seems like a burden. Seriously, that usually happens when I’m under stress from dealing with a lot at once. 2. I washed all the floors! Whoopie! ;) If you knew about all the arthritis in my joints, and how I hate the heat and humidity because it just saps my energy and makes me sweat rivers…you’d understand that it’s hard to get myself to do it. And it always seems that so many other tasks are calling out to me, like the dishes, laundry, the cooking, etc. But when your feet are starting to stick to the floors, and sometimes a slipper or flip flop doesn’t move forward with your foot and is left behind you…you know sweeping and washing the floors has moved to the top of the list in priorities. ;) So I did it! I was so proud of myself, and as soon as I was done (about an hour and a half), I flipped my flip flops off and walked on the floors and they just felt so CLEAN!! It was such a good feeling. 3. We’ve been dealing with a neighbor situation for a long time, but this week it really came to the forefront as we dealt with an issue that was thrust into our laps by this “sweet” family. Without going into all the details, I’ll just say that they’ve been harassing us, our children mostly, and the thing they seem to delight in doing the most is just staring at us for long periods, giving us the finger (even the step dad does), and shouting obscenities at us. Been meaning to do this for a while, but things have been pretty hectic here. Megan came to me one Friday night in May and told me she had a lump on her hand that hurt. I thought it was a lipoma, as she has one on her leg. I made an appointment for her with her doctor, who then sent Megan to see an orthopedist, who determined the lump to be a ganglion cyst. It was on the back of her hand, right above the wrist. So, since it was painful and in a bad spot, the doctor decided she needed surgery to have it removed. Sometimes doctors can take care of this kind of minor surgery in the office, but for some reason Dr. Grey didn’t want to, and it turned out to be a good thing he scheduled it for the hospital. 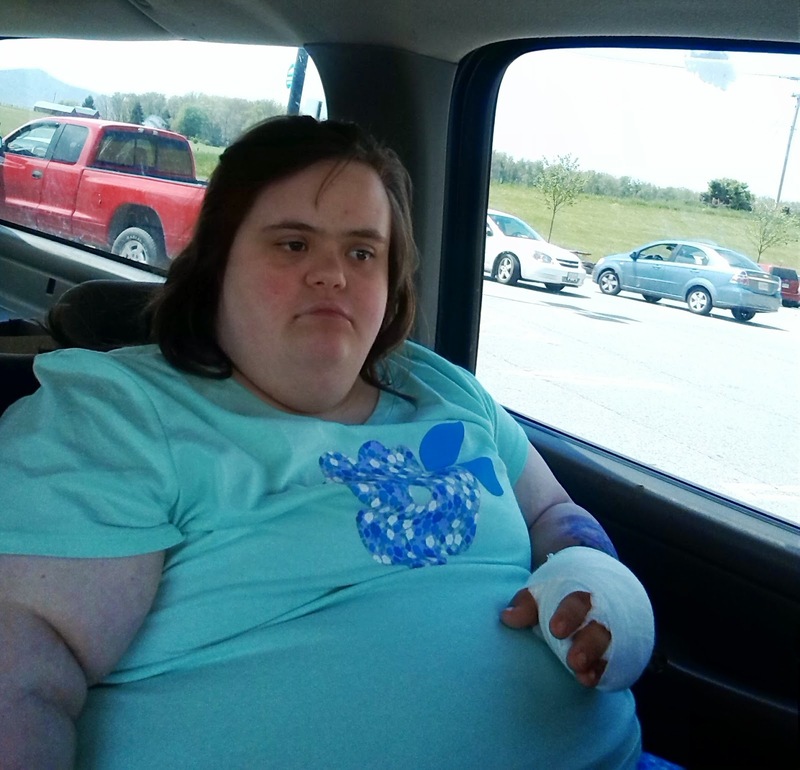 On May 9th Megan had her surgery, and the days beforehand were filled with her asking about it. ;) After they got into the OR and started the procedure, the doctor soon discovered that it was not a typical ganglion cyst, and it wasn’t simply on top of her hand, under the skin; it was in her tendon. What was to be a very simple routine excision turned into something a little more involved, with an incision twice the expected size. Megan made it through, though, and is doing very well now. Here is the outpatient surgery section. Megan had to put on a johhny. When I used that word talking with Phil, he had no clue what I was talking about. I guess down here in the south it’s called a gown. 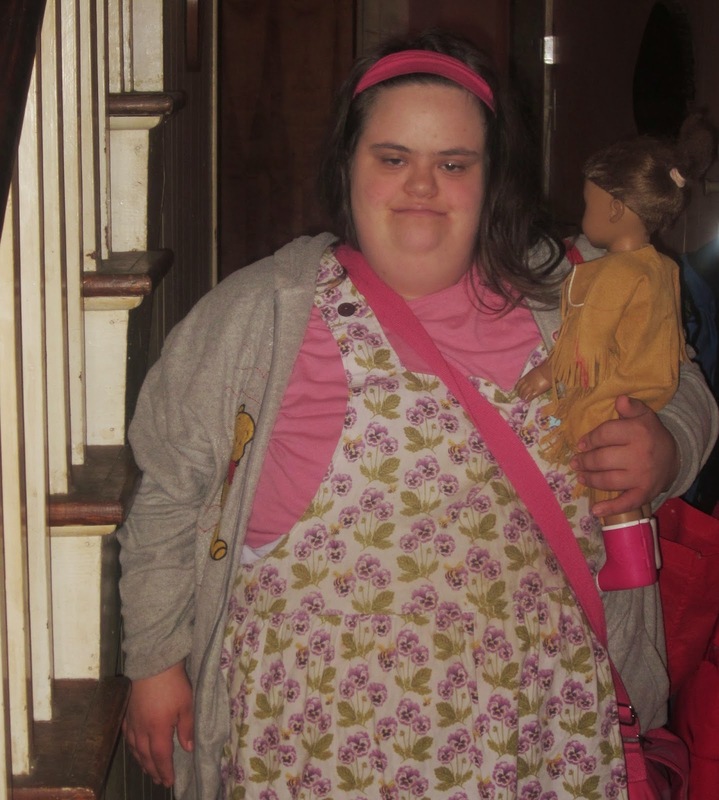 ;) Her doll Emily is with her, of course. The nurse who was with Megan most of the time was so nice. The nurses put on a big gob of numbing cream and covered it with a clear bandage. This was for her to get the IV put in. The nurse had me use a marker to identify the correct hand for surgery, then initial it. Another nurse came to wheel Megan away to the outer room of the OR. 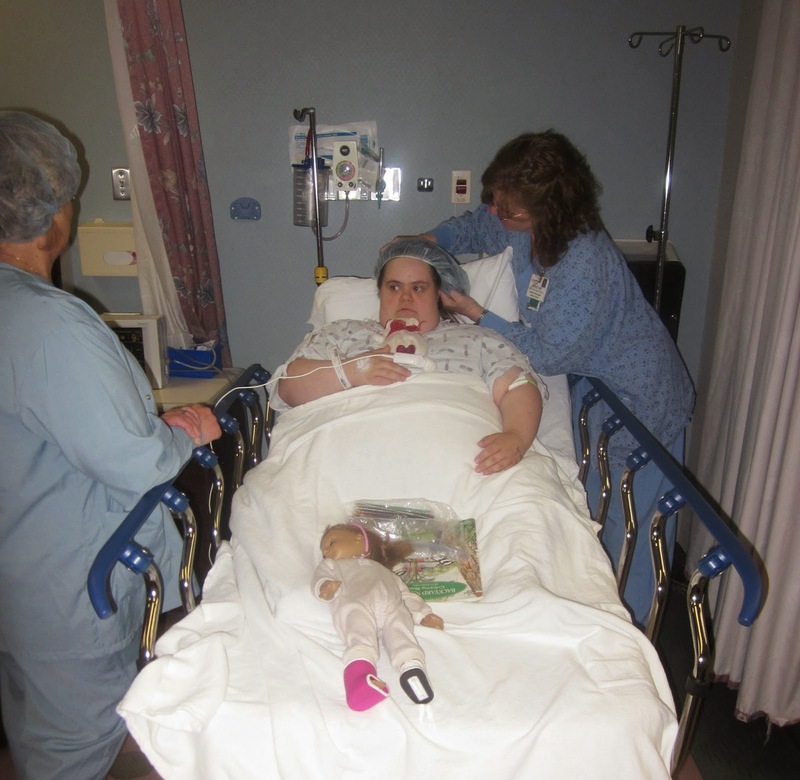 The nurse puts a surgical hair net on Megan. After many attempts, the anesthesiologist was able to get an IV into Megan in one of the most painful places. He looked like George Takei! The surgeon drew a picture on Megan’s arm; he does this with all his patients, and unfortunately I didn’t get a pic until after surgery, when it had had iodine wiped all over it. But you can still see how neat it was. He seems to be quite the artist. After the surgery, about an hour later, Megan came back to her room to rest a bit. A closer look at the boo boo hand, all wrapped up. Now flash forward two weeks later, and Megan went to the orthopedist’s to get the stitches out. Dr. Grey had made one stitch on top of her incision, one at each end, and the ones in the middle he “buried” to dissolve at their own rate, so she wouldn’t have so many to pull out. 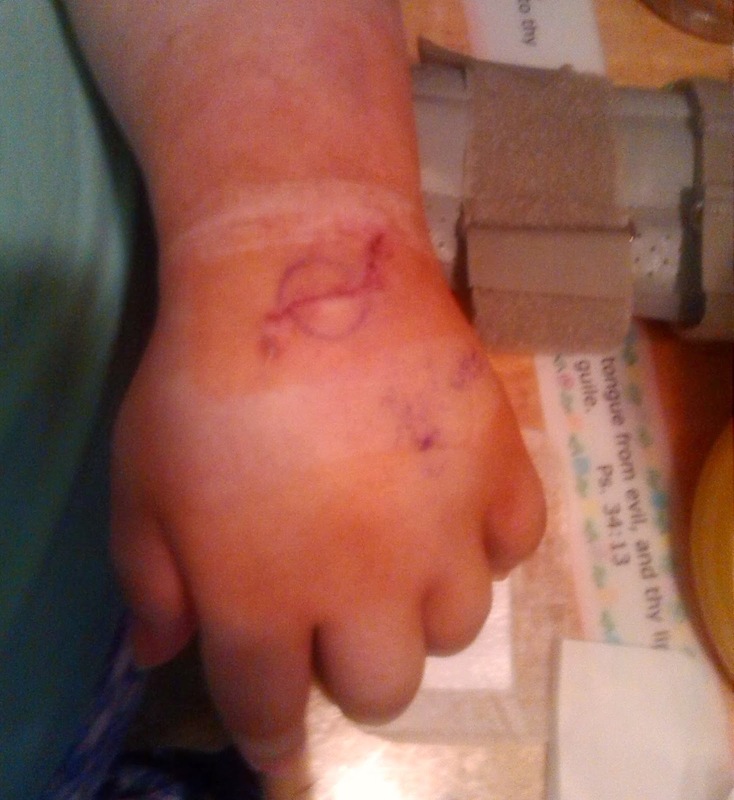 All done, but you can see even after two weeks how swollen Megan’s hand still is. Most of that went down about a week ago, but it’s still a little swollen even now, 5 weeks later. Here is the finished product, after stitches were taken out. The circle is where the incision was supposed to be; you can see how much longer it turned out to be.